It’s summertime and the livin is good! Chances are if you are looking at this page you have plans to head to the lake and plan to do a bit of floating. You can go and get inner tubes or pool floats and create your own floating island cluster like we usually do or you can step it up a notch and get an Inflatable Floating Island! It makes for a very relaxed environment Relaxed Friends = Happy Friends! There are two reasons why people get Inflatable Floating Islands . To Party and to relax, so naturally we split them up into those two categories as well as added some buyers criteria and additional accessories that will make your floating experience most enjoyable. Always make sure that you verse yourself with local water saftery rules of the U.S. Coast Guard and the Canadian Red Cross or any governing body in the location you are visiting before ploping one of these in the water. The Best Party Island Float: Party On! One of the first things I look at when looking for the best float party islands is how many beverages can it hold? Let’s face it if it cannot hold a lot of beverages it’s not a party island. Other things I look at are cool party related accessories such as music speakers, a canopy and different seating positions. I also look at Party Island Floats that have multiple access points when entering, this is often overlooked but is pretty important because some floats are almost impossible to haul yourself onto. Perhaps the most important factor is customer ratings. A party island is nothing if it is made of cheap materials and can be the single factor to making your party turn into a party pooper. In my mind party islands are one of the best ways to have a relaxing day in the outdoors, especially in the lake on a nice warm and sunny day. 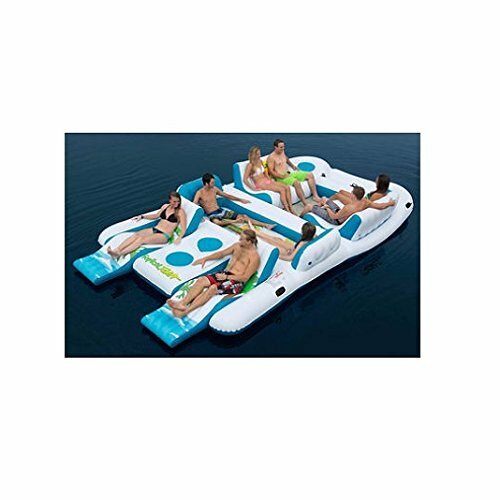 The Coolerz X5 Canopy Island is rated the Best of the Party Inflatable Floating Islands because of its layout. In terms of having friends around it gives you a lot of flexibility in terms of allowing you to sit or lie down all while being in a convenient layout that allows people to face each other. Another thing I really liked about this party island is the fact that it includes a removable canopy that allows you to escape from the sun once and a while. In terms of drinks the Coolerz X5 lives up to it’s name by featuring Six Cup Holders and Two Cooler Bags. I particularly like the layout of where the Cooler bags are placed because it is in an area where it is easily accessible to most people. The drink holders on the armrests are also cleaver because not everyone wants to hold their beer all day and get it warm. The Canopy also helps keeping your drink shaded which is great because beer or any drink for that matter can get warm pretty quickly in the sun. The thing I was not so Raven about was the climbing platform. While it is great that this inflatable floating island has a climbing platform I feel that there should be handles on the edges instead of the blue cup holder like slots. Many customers liked the fact that it could hold many people and found it to be the perfect solution to entertaining people by the lake. Some have even let it brave salt water and it has held up pretty well. Most of the complaints are directed at the quality of the mesh bottom in the seated area and the canopy. Some customers complained that the mesh bottom was flimsy which really means that it is not a good idea to stand on it for a long period of time. The complaints about the canopy were mostly about high wind situations and it coming apart. Looking at the Intex Inflatable Key Key Largo for the first time and you may wonder why it’s on this list. It doesn’t have the flair of of other floaties like the Seas Doo Mega Floatie with it’s speakers or the cool canopy and looks of the Coolerz X5. You may be on to something but where this floatie excels where other party islands lack is it’s quality. Intex in general is known for the quality of their products and this one is no different. This floating island is pretty simply built but has a smart overall layout plan. It is designed as an open style floatie that gives you lots of space to move . The Coolers are also right in the middle of the floatie making drinks accessible for almost everybody. It also has a lower surface area and comes with an anchor bag to keep it from blowing too far away. 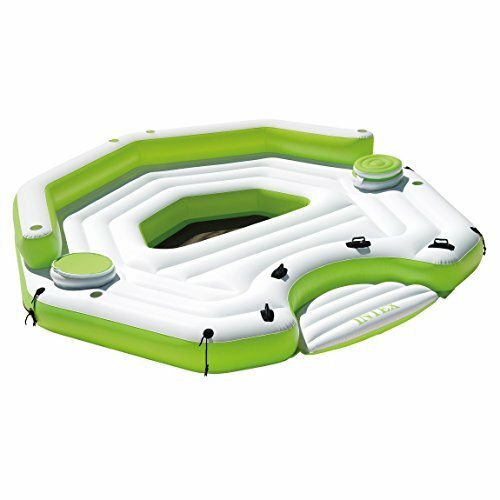 The thing I love about intex products, especially the Key Largo is the fact that it has multiple tie down points all around the floatie and can be used to connect other intex floaties for friends that may be using the River Run Floatie. In terms of customer ratings this one is the best out of the floating party islands. This is because intex has a good customer service team and the fact that intex products are for the most part smartly designed and are very durable. Many Customers have said this floating party island has hit multiple snags, sharp rocks and other treacherous things and came out unscathed. This inflatable island has even endured kids jumping around on it! There were otherwise few complaints about this island other than a few isolated manufacturing defects. The Boston Valves could be in a better spot as well as one customer said it was hard to flip it over and refill it on a boat. The Cooler Z Tropical Breeze is a great lounging Party Island that has a good open environment to allow for conversation. It gives you the option to simply slouch back or sit with two spots for slouching/ and four different areas to sit. It’s mesh bottom also makes it kid safe. The best features of the CoolerZ Tropical Breeze is the removable canopy that gives you the option to stay in the shade or get your tan on in the sun. It does come with one cooler bag although in my mind that is not enough. Six Cup Holders are a good option but they are all within the seated area. The handles for the climbing platform are handy and makes for easy boarding. Overall this is one of the more durable of the floating islands with it being able to even hold 10 people! It is made of high quality plastic which can withstand impact of sharp objects in the water like sunken logs and sharp rocks. Customers were also pretty happy with it’s inflation and deflation time. Most of the complaints were directed at the canopy and how it acts as a sail in windy conditions. It is recommended that you use and anchor for this floating island otherwise you will need to bring a pair of paddles to row it. A few customers complained that it was hard to climb up on as well. If you have some money to spend and want a truly durable party float Sea- Doo is the one for you! It is way more pricey than the other ones mentioned but it will last a lot longer due to the quality materials Sea Doo has put into this product. It has a good open floor plan that allows everyone to be in a circle and encourage lots of conversation however meaningful or non meaningful the subject matter. It has a large detachable boarding platform which helps get people into this great float! Unlike the other floats I have mentioned this one also has a built in speaker system that you can plug into your MP3! I find this feature particularly attractive because often times I am having to point my small Ipod dock on shore pointing towards the water only for us to faintly hear it on the water. So you can either take the speakers with you or get a bigger speaker system! The Tropical Tahiti is probably the most unique party island on this list. It’s seating plan is very unique but not the greatest for conversations by any means. Having two people faced the other way can be a bit of a hassle to look over your shoulder and talk every few minutes. The wade pool is a cool idea though, especially if you have children with you. It features Four Built in Coolers which is probably one of the most impressive things about this party island. Thats a lot of partying! Although everytime I go down to the cabin there seems to always be trips back to shore. Reviews on these Inflatable Floating Islands were pretty mixed. People seemed to either love it or hate it. Lots of people liked how big it was and the space that it provided while others were not. The quality of the floating island seemed to be a common theme. The Best Inflatable Floating Islands for Relaxing: Rest While You Float! Being in your youth blasting loud music on the lake while slamming down some brews may of been something you did when you are younger but now you just want to relax. Floating Islands are some of the best ways to recharge and get a tan. The gentle rocking of the water can even help you go to sleep, although be advised that it is a good idea to have an anchor and plenty of sunscreen available so you do not look like a castaway lobster. The main difference between Inflatable Floating islands and party islands is mainly the set up and floor plan. Inflatable Floating Islands for relaxation are more for a relaxed atmosphere that does not require a lot of room for things such as drinks. Many of these Floating Islands also feature a canopy to help keep the sun off of you. The Coolerz Tropical breeze features everything you need to cool off and relax for a while. It has that patio feel to it thanks to it’s large canopy that can keep you sheltered from the sun. If you want more or less sun simply rotate the floatie to the position that you would like in the water, the same way a skewer would work minus the burning flames ignited around you :P. Should you get too warm there is a mesh bottom that you can dip your feet in to feel refreshed. It’s Climbing platform helps you to be able to climb onto the island although truthfully I think the handles on it should be placed higher up to give you better leverage when hauling yourself up. The Coolerz features six cup holders that are strategically placed on all seated areas. This insures that no one is left out should a few of the beverages get passed out! Speaking of beverages the CoolerZ Tropical Breeze II also features two coolers should this relaxing floating island turn into a party island! Overall this inflatable island is well designed and versatile with the option of having a canopy and coolers and not. The CoolerZ Tropical Breeze II has a lot of positive reviews on it. People were very pleased with how it performed in the water and that it held air extremely well. One woman even said she floated down a river with it for 7 hours! Other compliments were it’s quick set up and take down time. Most of the negative comments were directed more towards the canopy which seems to be a reoccurring issue with these floating inflatable islands. This is the ultimate relaxing inflatable island that is ideal for couples. What’s more romantic than relaxing in the shade floating in the lake on a nice sunny day? It features a retractable sun shade that you can adjust with the side straps so that you can get just as much or as little sun as you want. 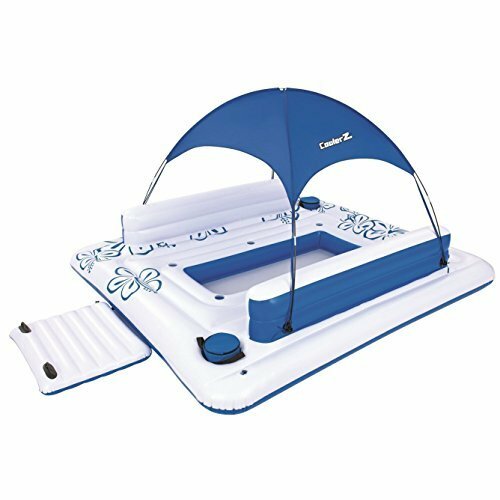 It’s features compared to other inflatable floating islands are pretty basic but it is easier to carry around and can be just as at home in a pool as it would in a lake. A few concerns I have is that while the Intex Canopy Island is durable, especially on the bottom side with reinforced PVC, it may be hard to climb onto, specially if you are swimming. There are no handles so you will need someone to give you a hand or just try to get in it yourself! Overall most customers had a lot of positive things to say about it. One person even went and used it as a beach bed, which is actually a really good idea. You end up saving a lot of money buying a specialty canopy and you get a comfortable platform to rest on at the beach and in the water! Many other people use it as furniture on the patio. Many people liked how durable this inflatable island was with one person even going as far as using it in the Florida Keys for 8 straight days of pure relaxation! Most of the complaints came from either manufacturer defects or the canopy being used as a sail which drags you away in a hurry. The Intex Relaxation is the perfect vessel for relaxing and a bit of water fun thanks to it’s design and setup. It can be used as a inflatable floating island that serves as a relaxation vessel or can be used as a party island! It has ample six person seating and included a large lounger section that can hold two to three people. This is a great floatie for those who want the option to lie back and relax or stay seated. It also comes with a large built in cooler and six cup holders that allows you to have some drinks with friends while floating in the sun. 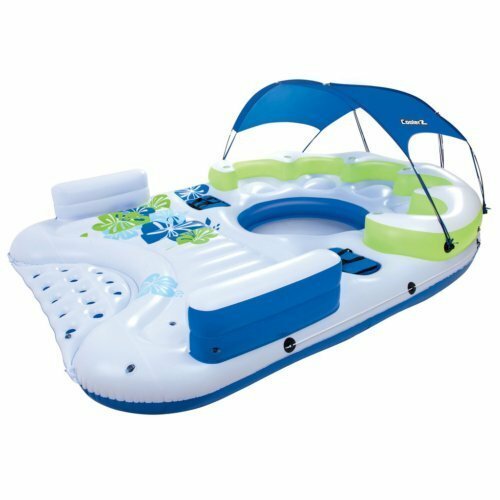 This is one of the bigger inflatable islands that we review but it is also priced very fairly making it a great large island budget pick. One of the things that is different about this island float from the others is that the middle section is not meshed! So if you are not the most confident of swimmers or have small children you may want to look at others on the list such as the CoolerZ Tropical Breeze II .Having no mesh is a great way to keep your feet cool though as the mesh usually ends up warming up the water and can often times attract dirt that is hard to wash off. Unlike the Intex Canopy Island this island float has a climbing platform that allows you to get on and off the float with ease. Many customers were pretty surprised but pleased with how big the Intex Relaxation really is. Many praised it’s durability as it even stood the test of kids jumping off of it even though the manual states otherwise. Others praised its stability even with more than the recommended amount of people on it. A few of the down sides besides the odd manufacturing defect (which you will find in all inflatable products) is the fact that this island float took a while to blow up. This was because of all the different compartments that needed to be filled up with air. A few people recommend electric pumps to make the process less painful. 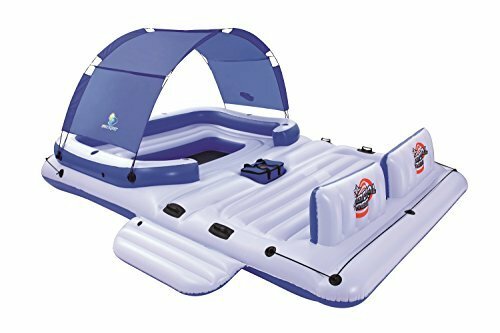 The Bestway Coolerz Kick Back Lounge Inflatable Floating Island is the ideal float for a small group of friends who want to spend the day relaxing on the lake. While it has a relatively simple design it certainly is a looker with it’s bright vibrant colors and it’s smart set up. This is a great float to use as an add on to your Floatilla (Group of floaties) or use for a small family or group of friends. It includes a climbing platform that allows you to get on and off of it with relative ease. Without having to struggle onto it like a beached whale. One of the things I really like about this setup is the fact that the Cooler is right in the middle of the island. This makes it easily accessible to everyone instead of waking up your friend at the end to pass you a beverage. The Five cup holders along the pillow backrest are also a good pick although I believe that there should be one located on the actual floatie for people who are lying down. Especially if the floatie has a capacity for three people. There was a limited sample of customers who viewed this product. Some thought it was great while others had some complaints about manufacturing defects. One Customer went as far to say that it did not last overnight in his pool while others say they’d spent 3 days on the lake using it. The Sportsstuff Cabana Islander is perfect for those islanders who seek shade while relaxing. It has a rather impressive cabana that covers more area than most other floating islands which is good news for those who like their lake naps. Even better it comes with a floating beverage cooler that holds up to 16 quarts that allows your drinks to be near by you the entire way. It is best for families or a small group of friends. While the Manufacturer says it can hold six people I feel that’s a bit too generous because you will start feeling squashed like sardines if you have three people on each side. The best ratio would be two people on each side for ample leg room space and space to move in general. The Good seems to far outway the bad with the Cabana Islander. Many customers really liked the cabana and bought this particular island float for this purpose. Some people even managed to have 8 people fit on the float at the same time. A few of the small concerns included child safety. One customer brought up a good point, the small hole in the middle, while great to keep your feet wet is difficult for children to get back onto the float without assistance. The Cooler is also too big to fit inside the hole. Other complained about the set up of the canopy and how the poles are relatively fragile and break when being set up. Other than those concerns complaints on this floating island are few. This is actually a pretty important accessory to have if you are or have purchased and inflatable island. A good Anchor will keep your island in place without getting blown away in the wind! These things will save you a ton of time and breath. They are definitely worth the investment especially if you are thinking of getting a large inflatable island. Chances are you may need a mode of transportation for things such as music players, coolers/ drinks and food, This is a great vessel to relay back and forth all you need is someone to volunteer to relay! The Perfect accessory for the kids to have fun on! Now you can have your own Bull Ride on the lake. If your Inflatable Floating Island does not feature a climbing platform this may just be the next best thing to tie onto the island and make your boarding a bit easier. How Many People WIll you be Hosting on it? I basically breaked this down into the two most common things people use inflatable islands for, partying and relaxing. People who want party Islands usually crave a more up right position to they can be social and drink their beverages with glee. On the other hand if you just want to relax and maybe catch some zzzz’s you would look for an inflatable floating island with a slouched back rest position that will give you that relaxation you deserve. If you have younger children you will probably be keeping a close eye on them and looking for something that is safe as well as entertaining. In this case I would go with a party island over more relaxing floating islands because it will give your kids some entertainment value. Also I will recommend some accessories that can keep your kids occupied. 2. Where will You Be Using it? If you are using an inflatable floating island for the pool chances are you can go for a less durable and smaller model than if you were to say going to the lake. Lakes have all kinds of obstacles such as sunken logs, sharp rocks and many other surprises near the surface that you have to seal with. When looking make sure that you find one with a higher customer approval rating and reviews where customers have actually used it on the lake. Budget can be a big factor when making a decision but there are affordable option out there. Typically Intex has the most affordable island floats to take a look out for them when shopping for inflatable floating islands. 4. How Many People Will you be Hosting on it? If you are having a crew of more than eight people it is best to get the biggest island float available or, you can buy a smaller one and tell your friends to bring their own floaties to make up a flotilla. When me and my friends all get together everyone usually brings their own floaties and we anchor and attach ourselves to a buoy or eachother. If you want shade while you are floating chances are you will want a floating island that comes with a cabana. Equally if you plan to load the island with drinks you will look for ones with multiple coolers available. Decide what features you would want and make this the final decision point.